State aid law is part of EU competition law and aims at constraining the funding possibilities of public authorities to sustain competition within the internal market, i.e. the 28 Member States. As a rule, State aid is prohibited as it distorts normal market conditions. Nevertheless, the European Commission (EC) can qualify certain public interventions as compatible aid, in case they contribute to the common interest like environmental protection, innovation or investments in underdeveloped regions. In case of S3 implementation, the selection of the appropriate State aid rule is not a difficult task since the main aims of S3 largely overlap with the objectives of compliance with State aid rules (e.g. fostering growth, innovation, SMEs). Similarities can be found between the approach of the EU State aid policy’s common assessment principles and S3 principles. Thus, several objectives of a RIS3 action plan may be aligned to one or more State aid rules, and beneficiaries contributing to the implementation of S3 may be able to receive State aid. plan are eligible for State aid (see Figure 1). SME access to finance: aid for ‘innovative’ start-ups: either innovativeness confirmed by external expert or R&D costs representing minimum 10% of total operating costs (Art. 22 (5); Art. 2 No. 80 GBER). received must remain under a series of notification thresholds to be eligible for GBER (Art. 4 GBER 2014. In the case of RDI aid, the notification thresholds are listed in Table 1 below. For advice on individual projects, MS may contact DG Competition of the European Commission for pre-notification talks. In the case that individual aid goes above the notification thresholds as defined in the RDI framework, an assessment criteria and process is defined focused on evaluation by Member States (Table 2). 3. The 2014-2020 period marks a clear shift of cohesion policy resulting in a higher number of projects where State aid is potentially involved. Several EC guidelines and documents have urged for the need to communicate complex procedures simply. The risk of clawback of state funds must be minimal to ensure confidence among stakeholders on the use of State aid. When aligned to one or more State aid rules, beneficiaries contributing to the implementation of S3 may be able to receive State aid and hence contribute to more efficient RIS3 implementation, particularly in regions with limited funds for policy support. European Commission Communication C(2014) 3282, 21.5.2014 Framework for state aid for research and development and innovation. Available at: http://eur-lex.europa.eu/legal-content/EN/TXT/?uri=CELEX%3A52014XC0627(01) – official EU document elaborating on the interpretations of state aid application to RDI. European Commission (2015) Analytical Grids on the application of State aid rules to the financing of infrastructure projects. Staff working document, Grid No 4, September 2015. Available at: http://ec.europa.eu/competition/state_aid/studies_reports/state_aid_grids_2015_en.pdf – the document reflects the current rules and decision practices in application of State aid rules to construction and upgrade of research infrastructure and innovation clusters. The content does not prejudge possible developments in the State aid enforcement practice and the application of public procurement rules. European Commission (2012) Guidance Note to the COCOF on Verification of Compliance with State Aid Rules in Infrastructure Cases. Working document COCOF_12-0059-01, 21.11.2012. Available at: http://ec.europa.eu/regional_policy/en/information/publications/cocof-guidance-documents/2012/guidance-note-to-the-cocof-verification-of-compliance-with-state-aids-rules-in-infrastructure-cases – The purpose of this note is to give guidance on the treatment of infrastructure projects under Cohesion policy rules. European Commission (2015) General Block Exemption Regulation (GBER): Frequently Asked Questions. Available at: http://ec.europa.eu/competition/state_aid/legislation/block.html – a guide to GBER regulation meant to familiarise authorities and beneficiaries with the GBER and help them to apply the rules to their specific situation. The most relevant existing tool is the eStateAid-WIKI of DG Competition of the European Commission. The ‘eStateAid-WIKI’ is an IT-tool to facilitate informal exchanges on general State aid matters between the European Commission’s services and the Member States and EFTA countries (including the ESA). The eState aid WIKI does not encompass the exchange of information regarding specific cases, i.e. information about specific companies or individuals, for which other formal channels are in place. Access to the eState aid WIKI is open to a limited number of users only, as controlled by DG COMP of the EC. Submitting a question is limited to a few authorities per Member State, while ‘read access’ is provided more widely. The Wiki represents a useful tool for increasing transparency on the interpretation of State aid rules. The State aid Scoreboard of DG COMP comprises aid expenditure made by Member States which falls under the scope of Article 107(1) of the Treaty on the Functioning of the European Union (TFEU). The data is based on the annual reporting by Member States pursuant to Article 6(1) of Commission Regulation (EC) 794/2004. Expenditure refers to all existing aid measures to manufacturing industries, services, agriculture and fisheries, for which the Commission adopted a formal decision or received an information fiche from the Member States in relation to measures qualifying for exemption under the General Block Exemption Regulation. As part of the State aid control, DG COMP allows to submit a complaint form online with regards compliance to EU rules and equal application of exemptions across the EU, here: http://ec.europa.eu/competition/forms/sa_complaint_en.html. 1. Data collection and analysis: this step includes the collection and analysis of all relevant data and cases related to the RDI State aid framework. This includes all the data listed above in the “Required data” section. 2. 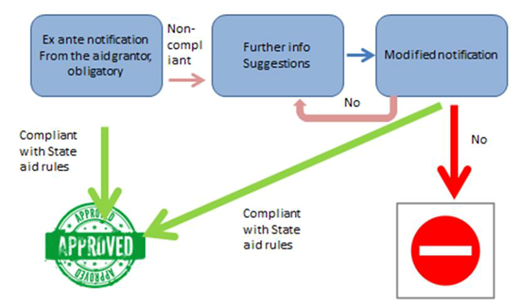 Design of RDI State aid compliance logic framework: based on all State aid rules and regulations, and with the help and assistance of a competition lawyer and DG COMP and DG REGIO experts, a logic framework on the use of State aid in support of smart specialisation will be designed. This logical framework should consider all details included in the regulations and outlined in the section “Description of the method” above. 3. Implementation of Online State aid quiz: once the logic framework is built, an online tool will be designed for regional policy makers and RIS3 Managing Authorities. The tool will guide the users through the main characteristics of State aid Law for RDI. 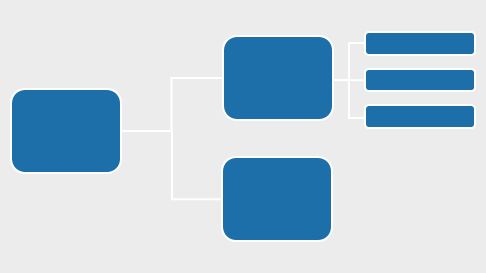 It will also provide a question and answer quiz (multiple choice, closed questions) based on the logic framework. The output of the quiz will be a State aid diagnosis that identifies, if any of the policy instruments included in the RIS3 policy mix/action plan is eligible for State aid. It will also give information on ‘next steps’ and ‘what to do next’ to benefit from State aid, including relevant contact points.